"We are now our own viruses." There's really no telling where we'll be as a race in ten years, twenty years, fifty years, etc. Chances are the day-to-day will largely remain the same for everyone, although some things might be a lot easier (and others more difficult). There's also the distinct possibility that we'll be living in one of any number of seemingly far-fetched fantasies, as is the case in Amazing Forest #1 from IDW Publishing. The stories are written by Erick Freitas and Ulises Farinas. "Tank" is illustrated by Julien Dufour, "Wolf Mother" is illustrated by Matt Rota, "Ronnie the Robot" is illustrated by Melody Often and "Bird Watcher" is illustrated by Yumi Sakugawa. Tales for the bold. Ideas for the strange. Wicked concepts that stir the minds of those with darkness in their hearts. A modern anthology that lends itself to a time when stories were short and ugly. Each comic is drawn by a different amazingly talented artist, each lending their unique talents to bring horrible happiness to the readers' skulls! Each of the four stories in Amazing Forest come with a pretty disturbing twist that taps into more carnal sensibilities. In "Tank," Freitas and Farinas explore the concept of viral outbreaks and the lengths we go to stop them and save the ones we love, not fully realizing that in stopping the virus we may inadvertently hurt the ones we love as opposed to helping them. "Wolf Mother" and "Bird Watcher" tap into our connection with nature, relying on the notion that we are tied to occurrences in nature more than we probably realize. "Ronnie the Robot" is a twisted take on love, offering a lonely wife desperately seeking the return of her husband and content just to have him back--even if it's not how she remembered him. The four stories collectively are pretty heady and offer glimpses into ourselves that we may not be comfortable viewing. The artwork in Amazing Forest #1 is pretty varied. "Tank" feels the most comic book of all the stories, as Dufour gives the story a lot of polish to it with the artwork. Rota's work in "Wolf Mother" is sort of psychedelic and trippy at points, blending together colorful skies and strange visual relationships between wolves and people. "Ronnie the Robot" has a handdrawn fairytale quality to it, as Often illustrates characters somewhat crudely but they exist against fairly sweeping farm backdrops. Sakugawa's approach in "Bird Watcher" is the most rudimentary of all the stories, but that doesn't prevent it from probably being the most poignant of all the stories in the book. 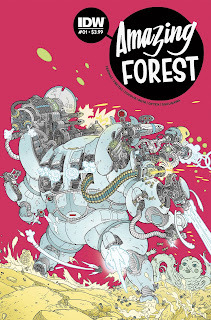 Amazing Forest #1 is an interesting book in that it's a lot deeper in its philosophies than the cover would suggest. Each of the stories tap into a different facet of human relationships and their effect on both one another and the surrounding environment. Freitas and Farinas craft evenly paced tales that effectively present these ideals. The artwork is inconsistent in style from story to story, but each style fits for the story the artists are matched with. Amazing Forest #1 asks some pretty interesting questions of its readers as framed against broader societal issues. 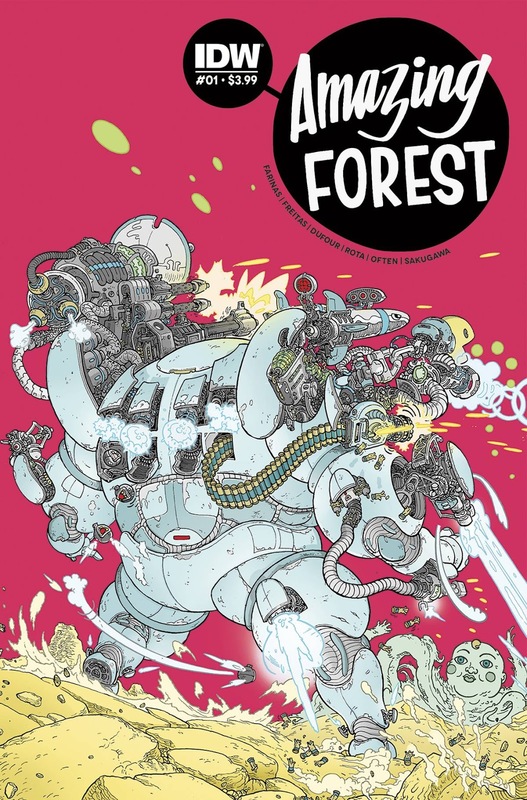 Amazing Forest #1 is in stores now.